Though these slips of paper or emails might cut like knives (especially at first), you can get past your highly-charged, emotional reaction if you take the time to understand why and how rejections are merely part of the professional writing process. Rejections have very little (and usually nothing) to do with you as an individual. In fact, most of the people from whom you'll receive "Dear John" or "Dear Jane" letters may never meet or speak with you. In reality, rejections are simply a result of the basic principle of supply exceeding demand. In the world of creative writing, the market is very narrow; hence, there are many authors all vying for the same writing job, project, or placement. This means that someone (or many persons) has to walk away with the prize while the others lick their proverbial "wounds" and live to compete another day. Rejections are extremely subjective, which is one of the reasons they are so difficult to understand. After all, didn't your last editor love you? Weren't your friends bowled over by your witticisms and insightful metaphors? Didn't that online fortune teller predict success by the end of the month? Chances are, you may never know exactly what it was about your article, poem, play, or short story that didn't resonate with paying clients. Again, that's just part of the experience, albeit a frustrating aspect of writing for a living. Some rejections are actually blessings in disguise, being opportunities for you to become a savvier, more concise writer. Was this the right venue for my creative writing? Did I choose the most appropriate creative writing piece to "wow" my prospect? By performing a self-inventory, you'll be in a better position to analyze your rejections, rather than allowing them to depress you or cause you to decidedly state, "I'll never try this again!" Rejections Are an Opportunity For You to Be Very Creative. You're a creative writer. You've just received a lousy rejection slip. Why not do something fun with it? Across the globe, writers with good perspectives on the professional writing process have chosen to approach their rejections in very unique, innovative ways. For some, that means shredding their rejection slips and putting the clippings in the cat box. For others, rejection letters become wall hangings, incentives to work harder and prove those naysayers wrong! 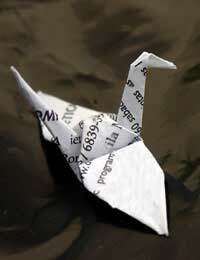 Still more authors like to turn rejection papers into airplanes, boats, or other origami creations, just for fun. These little methods of dealing with rejection operate as a way to let off a little bit of steam in a fun, productive manner. Follow suit and you'll be able to bounce back faster than if you wallowed in your disappointment. One final note - there's an old sales adage that says: Every 'no' gets you one step closer to 'yes'. Apply this philosophy to your rejections, and you'll realise that each rejection slip that comes your way actually brings you a bit closer to becoming a paid creative writer.